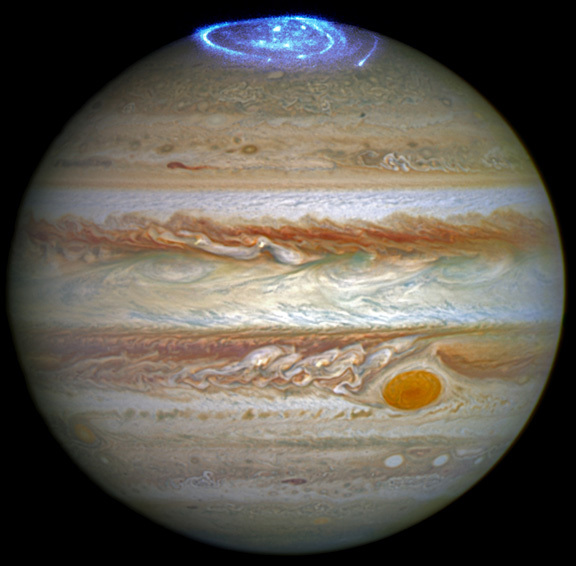 NASA Hubble Space Telescope image of Jupiter and blue aurora at the massive gas planet's poles. Jupiter is composed primarily of gaseous and liquid matter and is the largest planet in our solar system with a diameter of 88,846 miles (142,984 km) at its equator, which is eleven times the size of Earth's equatorial diameter of 7,917.5 miles (12,756 km). Credit: 2016 NASA, ESA, J. Nichols, Univ. of Leicester.